Goaltender Josh Thorimbert, a recent draft pick of the Lincoln Stars, has recently committed to play hockey at Colorado College, starting this fall. 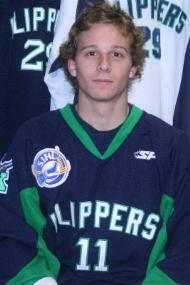 Thorimbert was selected by Lincoln in the 18th round of the 2010 USHL Entry Draft. Like former Stars goaltender David Reekie, Thorimbert is a native of Saskatoon, Saskatchewan. Thorimbert played for the Kindersley Klippers of the SJHL last season, compiling an impressive 26-14-4 record, 2.66 goals against, and .917 save percentage in 58 games. I believe Thorimbert was a long shot to attend the Stars tryouts before this news, so at least we know not to expect him at camp on June 13th. Thorimbert exploded on the hockey scene last season and attracted a ton of attention from scouts with his efforts in the SJHL. Colorado College has a very good hockey program, and apparently they didn't want to wait to get him on campus. The Stars drafted three goaltenders in the USHL Entry draft last month, so that leaves Lukas Hafner (7th round pick) and Trevor Gutierrez (21st round pick) remaining. Kevin Murdock is all but guaranteed the starting goaltender position for the Stars next season, but there is a need for a backup. Hopefully we'll see Hafner and Gutierrez at tryouts here in 9 days, but you just never know who will show up. Just because they were drafted by the Stars doesn't mean they have to attend tryouts. The Stars will invite a number of other goaltenders to the tryout camp, so they will all compete against each other for that lone goaltending spot on the roster. Just 9 days until tryouts, folks! Hafner is interesting, he was the season-long backup really on his NAHL division-winning team, but his stats were better and he got the start in the playoffs due to the starter's injury. Went 0-3, but had a 92.3 save % and a 93.8 season save %...Yeti already has mentioned his 80 saves on 84 shots in a three overtime game, including 27 saves in a single overtime period...some goalies face that during an entire game. Hope to see this kid at tryouts. Good size too...and has three years of USHL eligibility.